Ahhh. 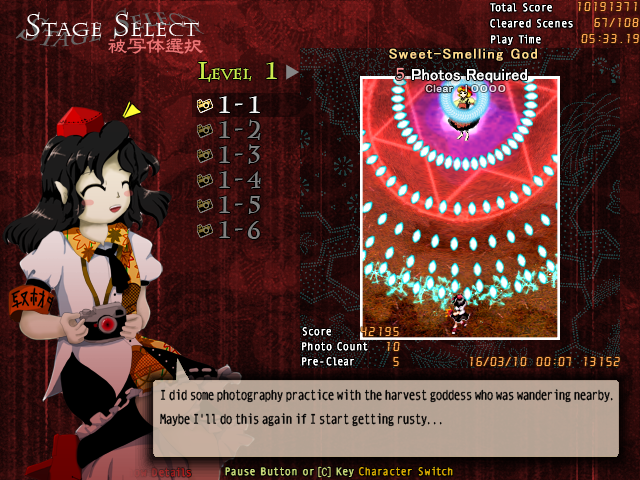 Just when you think that a game of a super hard danmaku photograph capturing is enough, ZUN stamped a huge NOPE and made ANOTHER one. Seriously, this kind of game is hard. 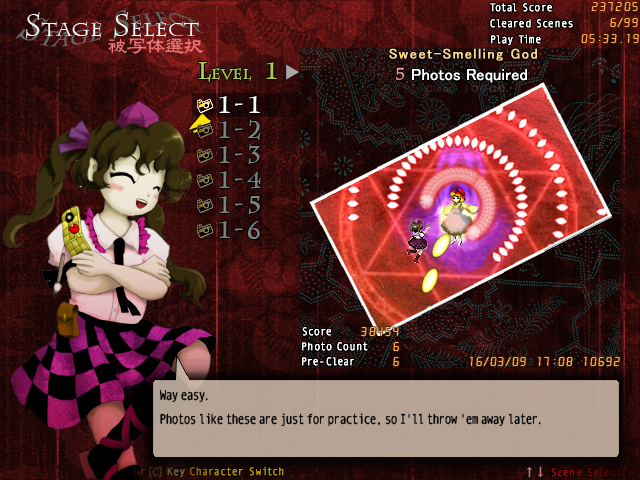 Well, practically most people see all touhou games are generally hard but trust me, this genre of photograph capturing is on a new tier of difficulty above its regular release. ~ TH 12 and also, there is a new rival on newspaper release. 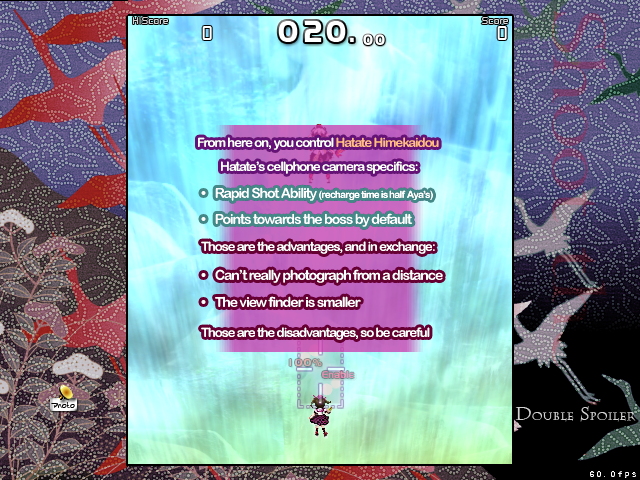 Himekaidou Hatare, a tengu like Aya, decided to declare war against Aya as the player progress through the game. Longer time gap between shots due film rolling. Longer range due to enhanced zooming but focused area gradually gets smaller by time. Shorter time gap between shots. Inferior range from Aya due to limited zooming but focus area does not shrink as obvious as Aya when zooming. My opinion? HARD but should be passable with great perseverance. . The game might have much refined gameplay but that doesn't really makes the game easy. Imagine every single stage there will be 4 difficulties in it? And there is more than 60 stages to go through. Imagine Reimu throws you a bunch of HUGE newspaper at you? (video shown above). Anyways, the game is still fun but some endurance and also... extreme focus, patience and the player's insight on danmaku gaming is essential to actually enjoy this game. 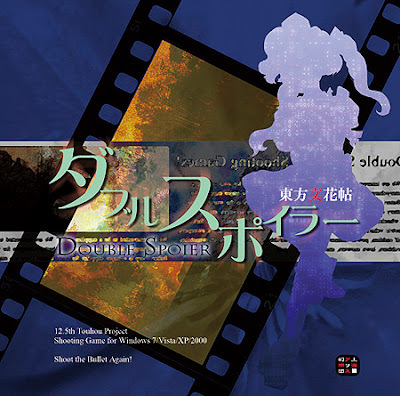 This marks the end of the first part Modern Era of Touhou Project. Next week will be the review on the first game on the second part Modern Era. 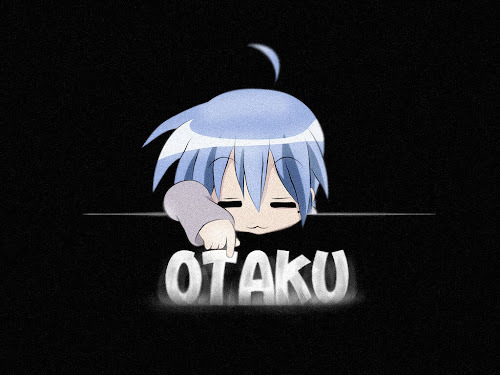 See ya!